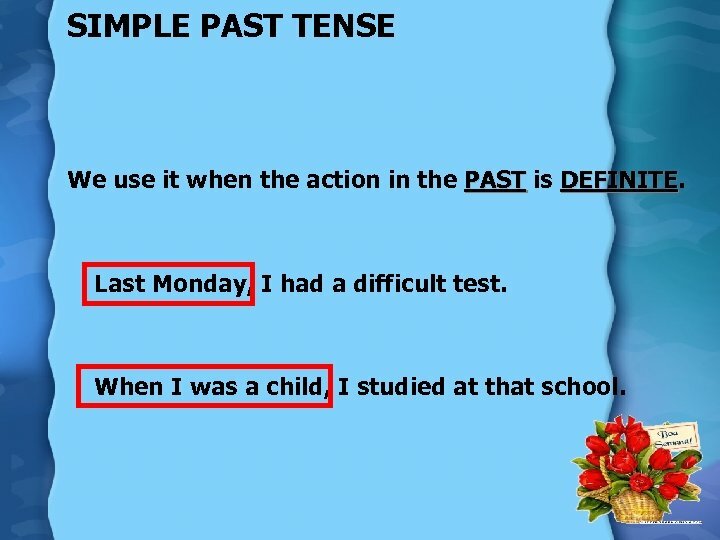 SIMPLE PAST TENSE We use it when the action in the PAST is DEFINITE Last Monday, I had a difficult test. When I was a child, I studied at that school. 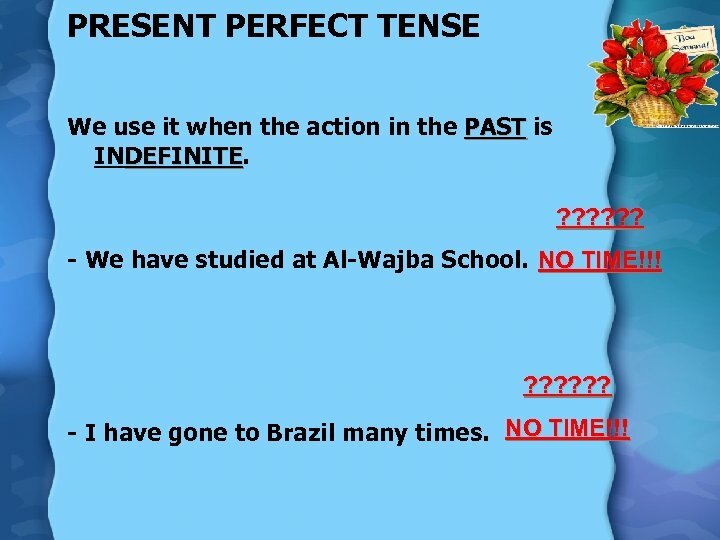 PRESENT PERFECT TENSE We use it when the action in the PAST is INDEFINITE ? ? ? - We have studied at Al-Wajba School. NO TIME!!! ? ? ? - I have gone to Brazil many times. NO TIME!!! 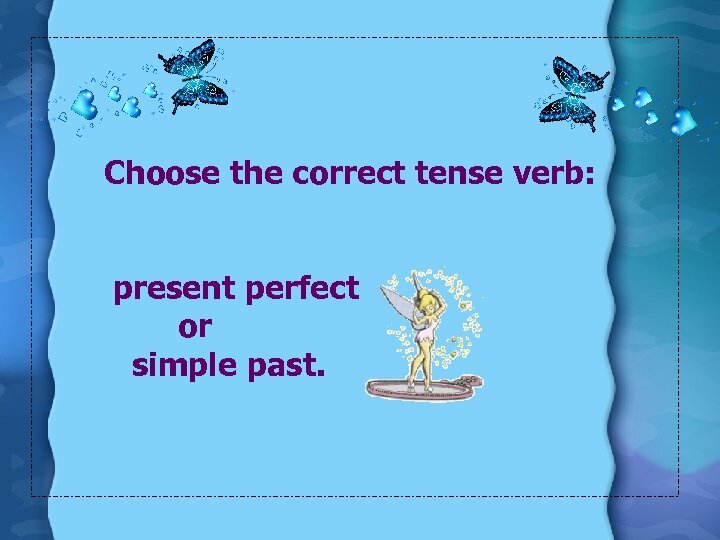 Choose the correct tense verb: present perfect or simple past. 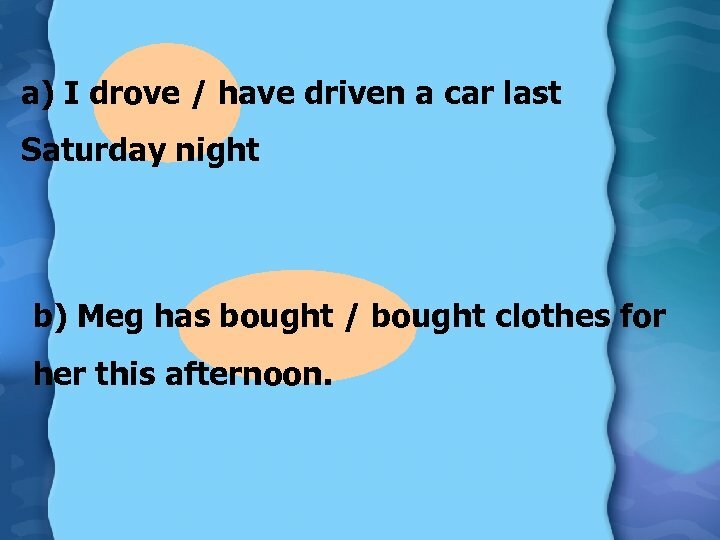 a) I drove / have driven a car last Saturday night b) Meg has bought / bought clothes for her this afternoon. 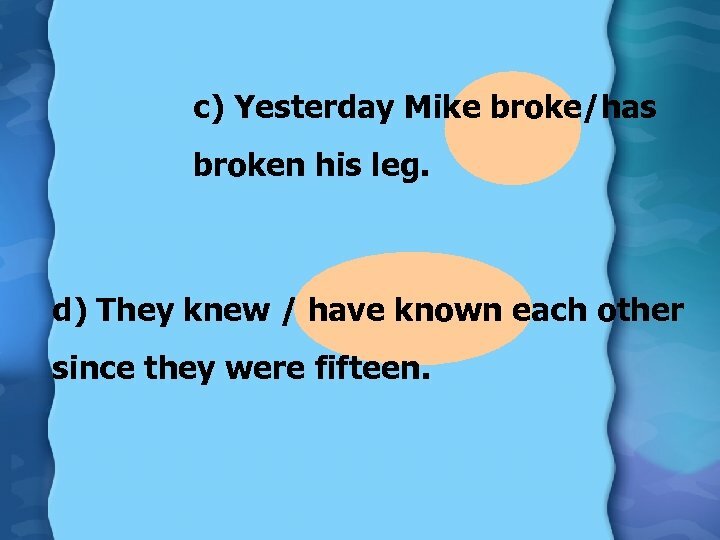 c) Yesterday Mike broke/has broken his leg. d) They knew / have known each other since they were fifteen. e) We haven’t seen/didn’t each other since last year. 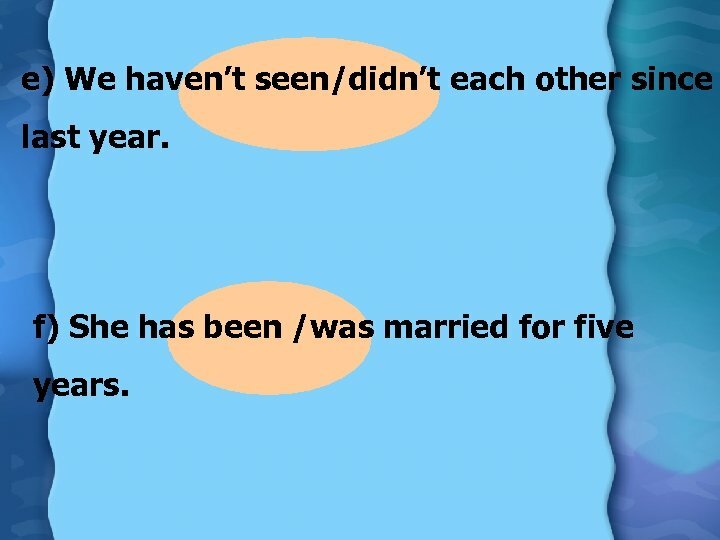 f) She has been /was married for five years. 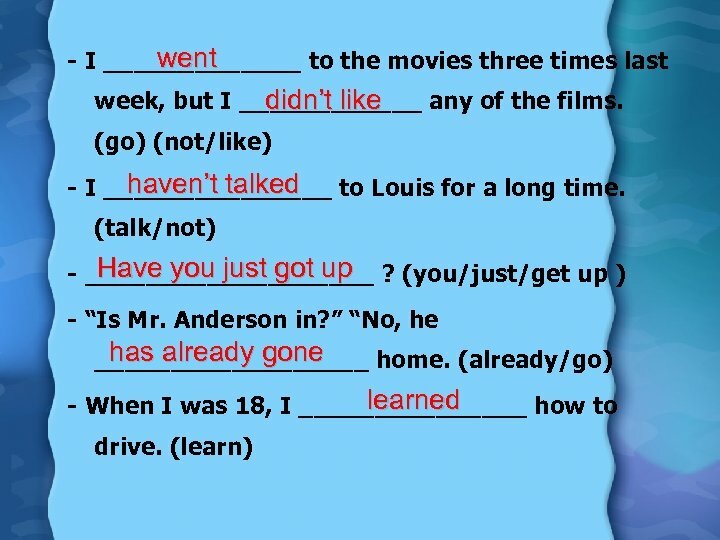 g) He worked /has worked hard last summer. 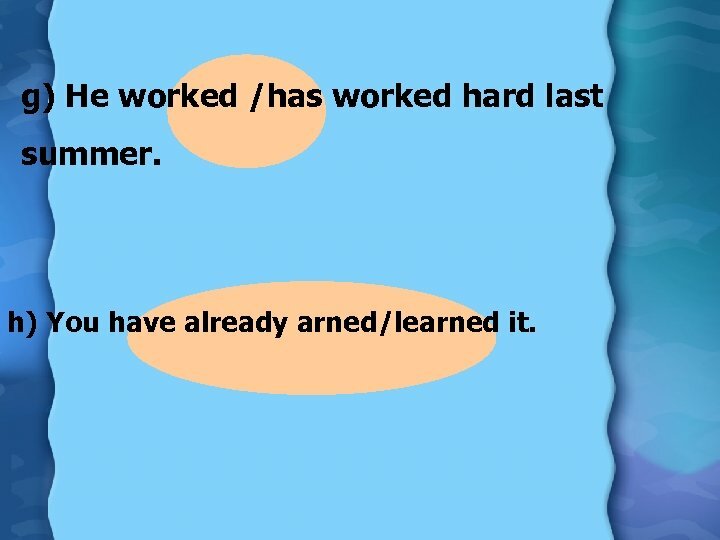 h) You have already arned/learned it. 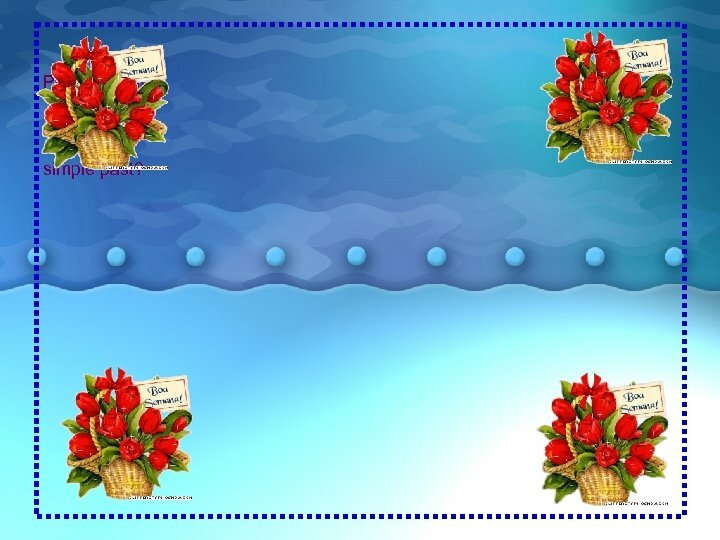 RUTH RENDELL Many people call Ruth Rendell `the new Agatha Christie´. She ______ (be born) in London in 1930. 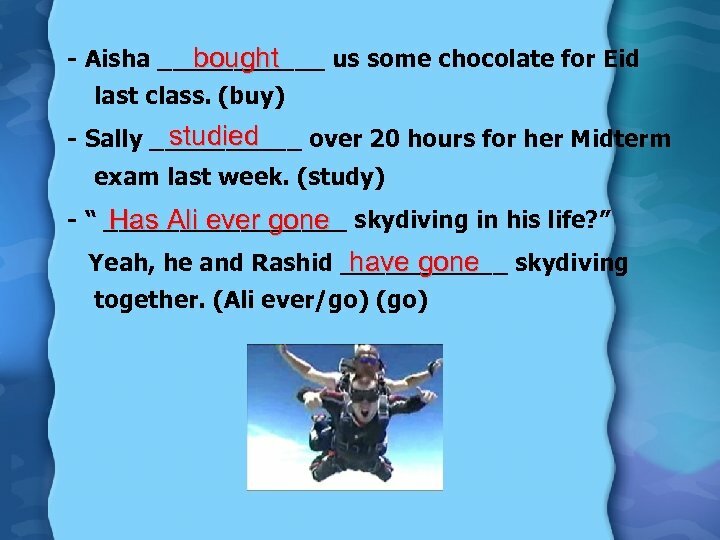 When she _____ (leave) school, she _____ (work) as a journalist. In 1950 she _____ (get) married to another journalist and they had a son. In 1973, after twenty-three years together, they got divorced, but four years later they re-married. Ruth Rendell _____ (publish) her first novel in 1964. 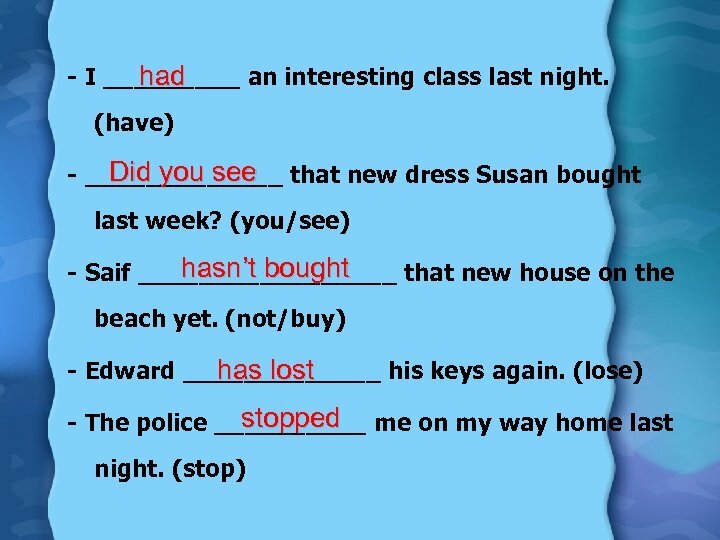 It _____ (be) an immediate success. 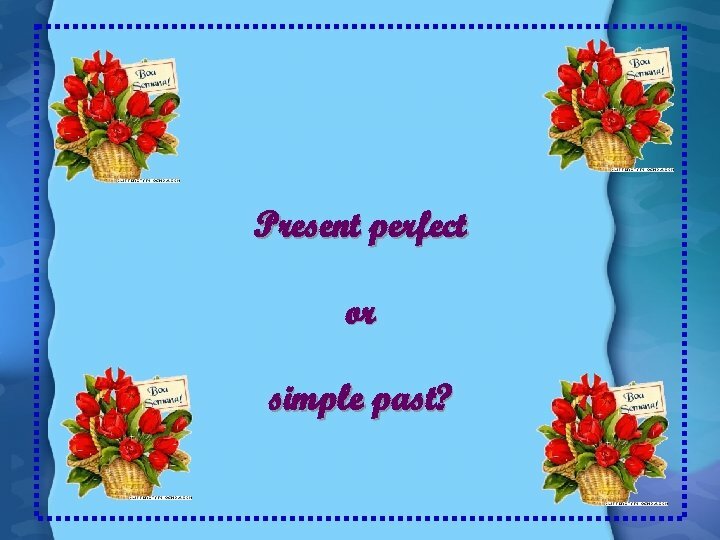 Since 1964 she _____ (write) many more novels, and is still writing today. Her famous detective is a middle-aged policeman, Inspector Wexford. 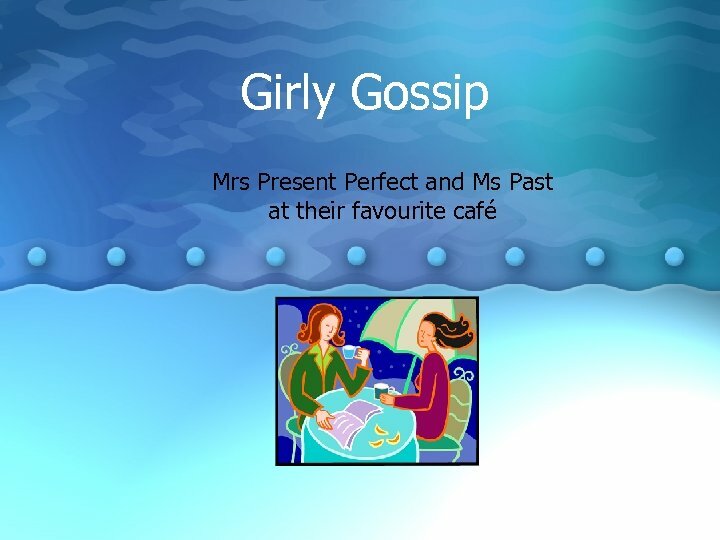 She _____ (publish) other books under the pen name of Barbara Vine, and she _____ (win) many prizes for her novels. Since 1986 she _____ (live) in a sixteenth-century farmhouse. 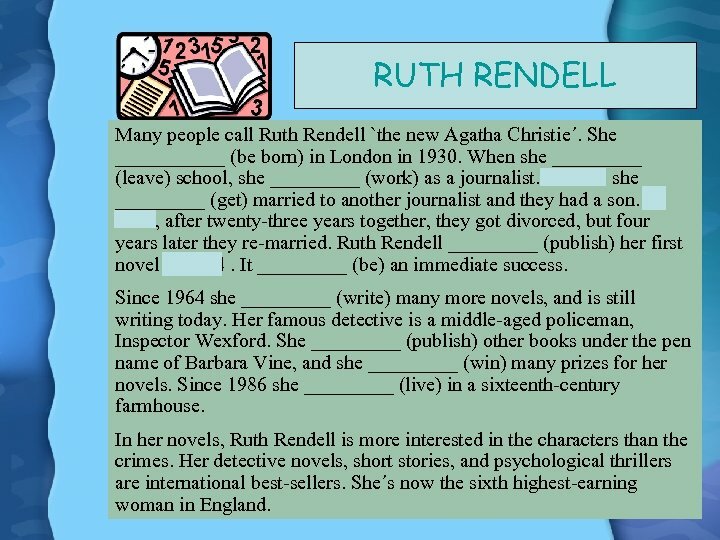 In her novels, Ruth Rendell is more interested in the characters than the crimes. Her detective novels, short stories, and psychological thrillers are international best-sellers. She´s now the sixth highest-earning woman in England. 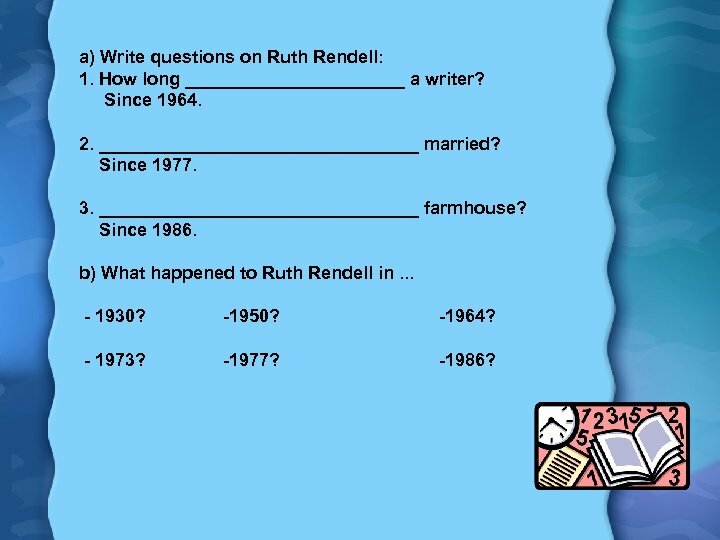 a) Write questions on Ruth Rendell: 1. 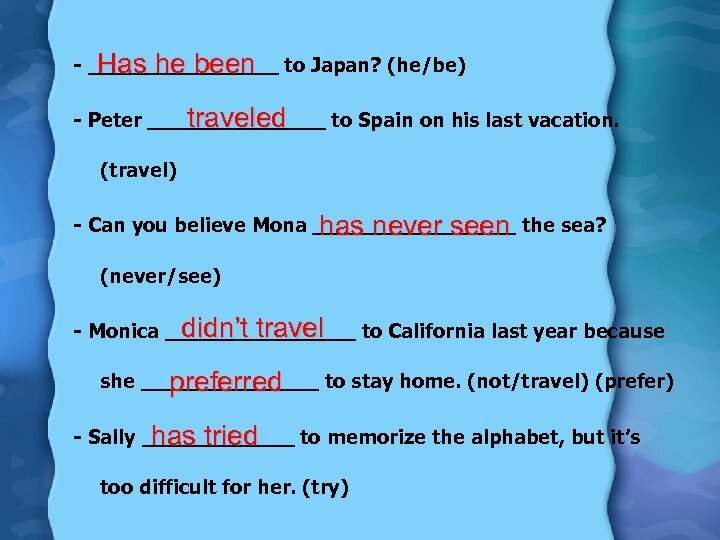 How long ___________ a writer? Since 1964. 2. ________________ married? Since 1977. 3. ________________ farmhouse? Since 1986. b) What happened to Ruth Rendell in. . . - 1930? -1950? -1964? - 1973? -1977? -1986? Haircut I’ve just been to the hairdresser’s. Oh, have you? Which stylist did you go to? To Marge as usual. Did you wait a lot? 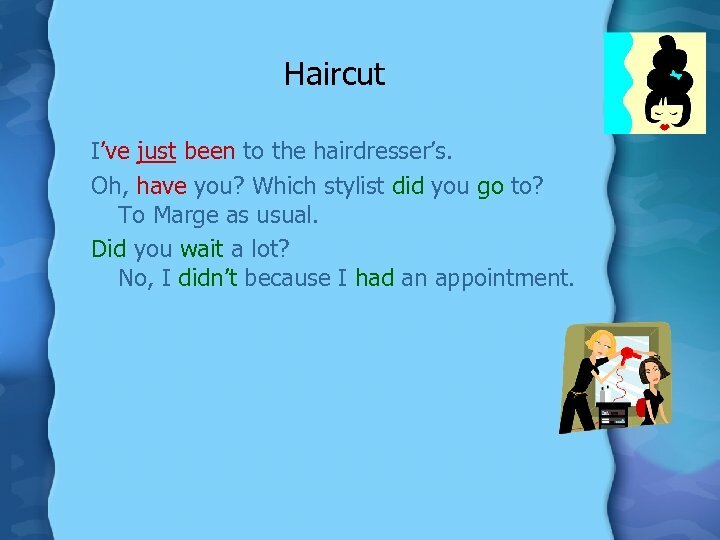 No, I didn’t because I had an appointment. Clothes I’ve already bought a new dress for Jane’s wedding. I haven’t had time to go shopping yet. Where did you buy yours? At Dior’s. It was very expensive but I have never had such a beautiful dress before. 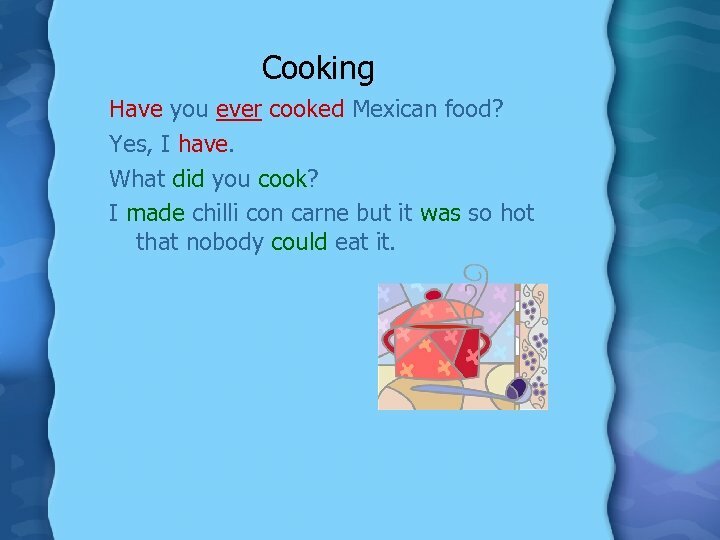 Cooking Have you ever cooked Mexican food? Yes, I have. What did you cook? I made chilli con carne but it was so hot that nobody could eat it. 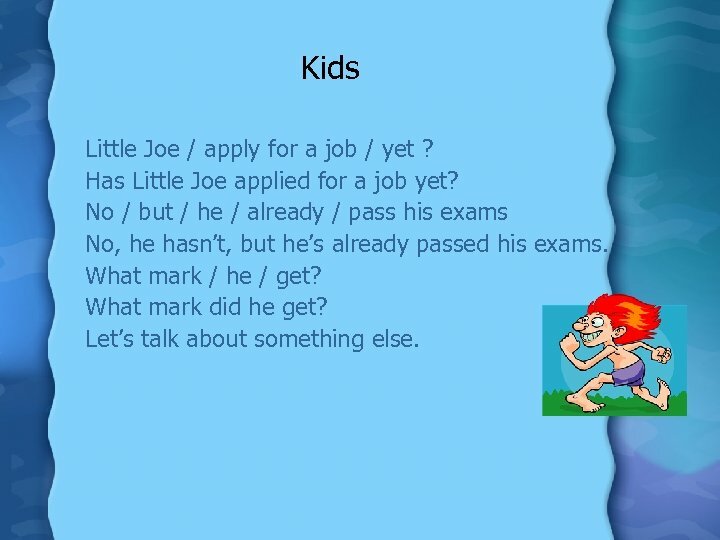 Kids Little Joe / apply for a job / yet ? Has Little Joe applied for a job yet? No / but / he / already / pass his exams No, he hasn’t, but he’s already passed his exams. What mark / he / get? What mark did he get? Let’s talk about something else. Neighbours The Riches / just / get back / from holiday The Riches have just got back from holiday. Oh? Where / they / go? Oh, have they? Where did they go? 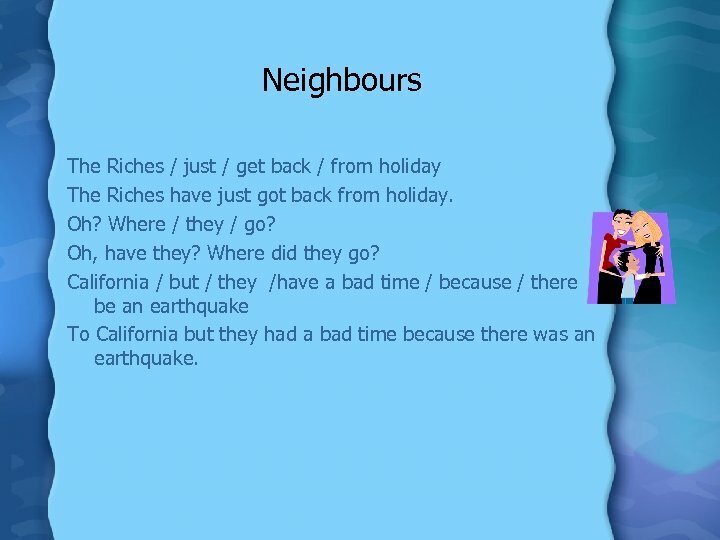 California / but / they /have a bad time / because / there be an earthquake To California but they had a bad time because there was an earthquake. 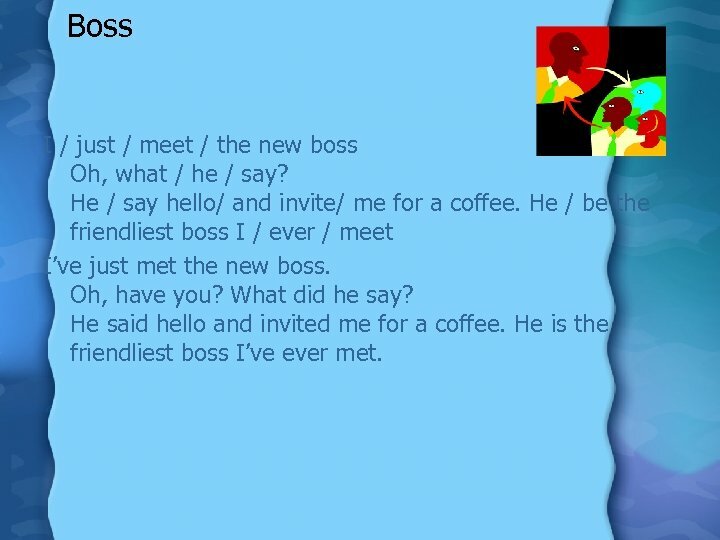 Boss I / just / meet / the new boss Oh, what / he / say? He / say hello/ and invite/ me for a coffee. He / be the friendliest boss I / ever / meet I’ve just met the new boss. Oh, have you? What did he say? He said hello and invited me for a coffee. He is the friendliest boss I’ve ever met. Soap Operas You / see / the latest episode of Roses and Daffodils yet? No / what / happen? Julia / leave Paco / because he /cheat on her Have you seen the latest episode of Roses and Daffodils yet? No, I haven’t. What happened? Julia left Paco because he cheated on her. Husbands Your husband / ever / forget / your birthday? No / never What / he / buy for your last birthday? 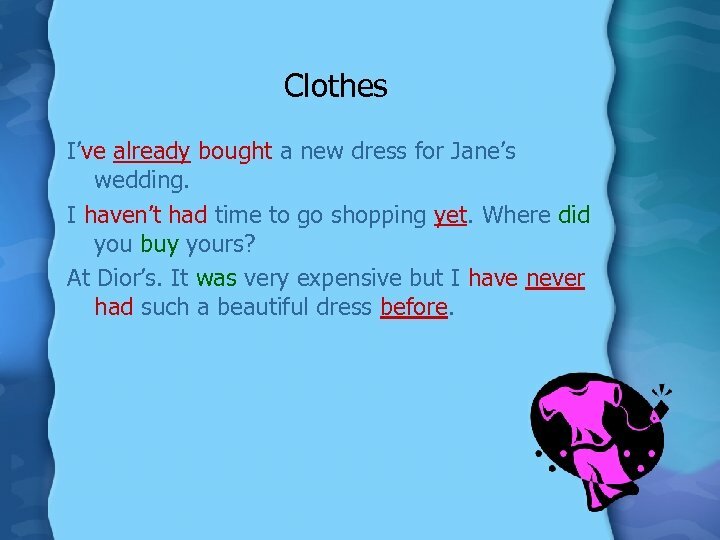 He / not buy / anything. 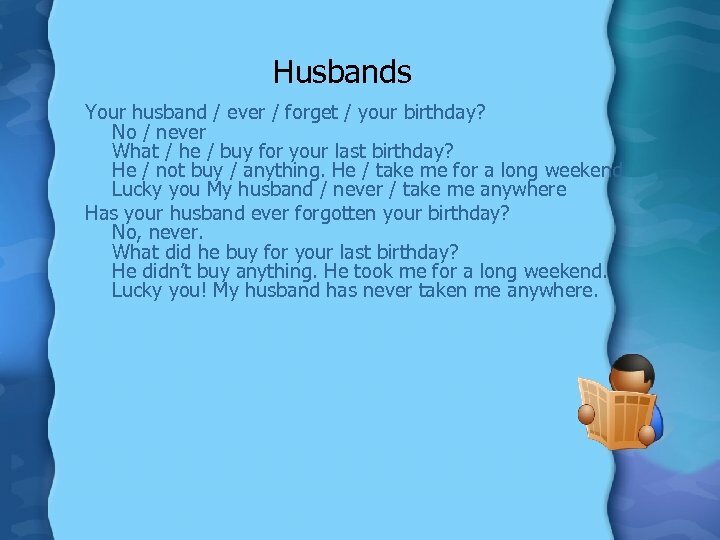 He / take me for a long weekend Lucky you My husband / never / take me anywhere Has your husband ever forgotten your birthday? No, never. What did he buy for your last birthday? He didn’t buy anything. He took me for a long weekend. Lucky you! My husband has never taken me anywhere.